When considering a proven route for taking a pop act to achieve towering levels of success, the one virtue that exceeds them all is sacrifice. An act becomes an investment once he or she submits to scrupulous consultation, or in some cases, hopelessly depends on the guidance to boost one’s confidence. It has been historically proven that a surge of popularity is too intangible to explain, and yet, vainglorious major label moguls continue to believe they’re right “on the money” the more they command the entire process. For well over a decade, Christ Martin has been making grand gestures while maintaining an unaffected, jokey demeanor to detract any controversy from ever coming his way. But it seems as if every subsequent release only raises more demands, which may presumably be taking a toll on him. In a recent statement, he publicly voiced his concerns about Coldplay’s relevancy as “the biggest live act in the World”, even going as far as comparing their success to hitmakers almost half his age like Justin Bieber and Adele, two artists whose sole correlation to them is co-existing in an old fashioned form of corporate power. What poor, misguided Martin doesn’t seem to understand is that long-standing acts, no matter how hard they push, are inevitably victims of time, tied to a specific generation that is growing up with them. Granted, Martin readily believes that maintaining histrionic status is weighed upon by quantifying one’s workload. And there’s a truth to that, but the cold, hard fact is that the general public hardly ever favors a rock band as much as a power balladeer or a fleeting Internet sensation. For over a decade, Coldplay have been fortunate enough to keep on their reign, having inherited the title from other major players like Bon Jovi and U2 without ever sweating their prim, clergymen embodiment. Wrongfully linking artistic merit with commercial viability will most likely beget negative results, which will consequently jeopardize their pious etiquette. Martin, always one to belittle his efforts, should be more frank about the fact that Coldplay have already secured their place as stadium fillers, so even the outcome of Mylo Xyloto selling two million copies instead of five won’t make a dent of a difference. Judging by the opening cannon shot of Hurts like Heaven, whose vocoder vocal effects and overtly fine-spun synths could clean the gunk off your ears, the predisposed path to prosperity is more secure than a warranty extension. Following a shamelessly habitual streak (which also includes Martin’s silly oxymorons and a frolicsome rhythm section) they take their chances at executing chart pop with Paradise - it’s typically anthemic (with football-cheer choruses and images of dark and stormy nights), but it throws an unforgivably reeking, Timbaland-like production seemingly scrapped from the OneRepublic sessions. Not even the church like opening can salvage it; too late to apologize, guys! The middle section of Mylo Xyloto is also its most foreseeable – Charlie Brown surrenders to the fist-pumping, call-to-life exuberance of Clocks, while Us Against the World is the tepid romantic acoustic ballad we’ve come to expect as turkey stuffing (file under: A Message, Green Eyes). Just as it begins to turn alarmingly lackluster, Coldplay rises with a banger – Every Tear is a Waterfall is the type of bona fide single they excel at, composed of a Euro-dance throb and a stint of guitar licks that never fails to force my lips to slant upwards. It falls under the category of songs you hate yourself for loving so much, and at the same time, makes you wonder why they didn't light up any torches when they played at Red Rocks Ampitheatre. 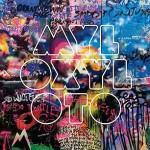 Mylo Xyloto does have its unpredictable moments, some of which work more effectively than others. Major Minus is Coldplay’s usual left field track, a doom-laden acoustic assault that quivers in the same way as The Edge’s electric delays, dutifully inspired by his contributions to Achtung Baby. U.F.O. revisits a ballad template with a subtle wall of sound, but its message on uncertainty and delirious confusion is simply delightful. And then there’s the much-documented collaboration with Rihanna, Princess of China, which trounces a mad, post-apocalyptic synth pop beat. Though unsurprisingly out of place, Rihanna’s brief appearance steals the show with an added twinkle to the heavily textured backdrop, but the fact that both their voices hardly mingle together makes it sound somewhat disconnected. Martin keeps true to his words when he talks about extracting some inspiration from other sources, like in the metronomic, dubstep-inspired piano ballad Up In Flames. What could be considered as a first in its class, the rhythmically calculated rim taps breathe some life into the love against all odds reverie. Which brings me to another point: Mylo Xyloto has been highly publicized as a concept album set in some sort of steam punk rendering of the future, featuring two lovers holding their territory as they rebel against an tyrannical regime. Instead of giving us vivid, poignant depictions of its time and place, most of the story feels gravely deficient – Martin spends his energies rhyming verses with his accustomed soppy drivel, all under a WW II inspired motif with a technically naive outlook of the proceedings. When putting all the pieces together, (robotic effects, allusions to graffiti art, the power of music saves all), one begins to wonder if Martin’s initial ideas stemmed from Styx’s Kilroy Was Here. Mylo Xyloto shows no scarcity in the drama storage room – under their jauntiest disposition, Coldplay make their best efforts to elevate a truly kaleidoscopic pop experience. Once more, they bust out a bracing, if slightly ineffective, concept that showcases them at their most idiosyncratic without losing sight of what their audience wants: a dependable dosage of rapturous anthems. But there’s something sorely missing here – following the triumphant career high of Viva La Vida may have something to do with it, but it feels as if Martin is beginning to fall into the pressures of becoming commended.